Added by admin on September 13, 2018. Britons visiting the EU could be hit with mobile phone roaming charges in the event of a no-deal Brexit. 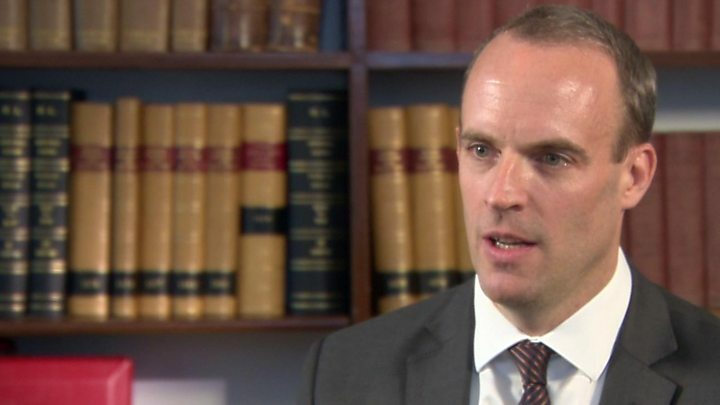 Brexit Secretary Dominic Raab said the government would try to force firms to limit charges but he could not give a “cast iron guarantee” on the issue. The EU rule capping what mobile phone operators could charge each other will stop applying to the UK after Brexit. Meanwhile, the Bank of England governor told the cabinet house prices could drop 35% in three years without a deal. Mark Carney presented cabinet ministers with a range of scenarios under which prices would fall if the UK and EU do not reach a deal. A cabinet source confirmed that he said the Bank of England was prepared for a worst-case scenario where house prices could go down by as much as 35% over three years. In an interview with BBC Political Editor Laura Kuenssberg, Brexit Secretary Dominic Raab said the government was trying to give the “reassurance that consumers need” on the issue of mobile phone roaming charges but admitted that European operators could pass on charges. The government has published its latest contingency plans in the event of a no-deal Brexit. On mobile phone charges, the document says that “in the unlikely event” of the UK leaving the EU without a deal, consumers should “check the roaming policies of your mobile operator before you go abroad”. Mr Raab told Laura Kuenssberg Cabinet ministers earlier spent three hours examining “all the plans across government to make sure we can manage, mitigate or avoid the risk of a no-deal scenario”. Labour’s shadow Brexit secretary Sir Keir Starmer said: “The only reason the government is talking about no-deal is because the Tory civil war on Europe prevents the prime minister from negotiating a good deal. Extra charges for people using their phones in another EU country were scrapped in June 2017. But the EU regulation banning them will not automatically be part of UK law after Brexit on 29 March next year. In theory this means UK mobile operators, if they want to, could reintroduce the charges that could make it expensive to use a mobile phone in another EU country. However, the government said it would legislate to make operators set a cap of £45 a month on data usage while abroad – in line with the current EU limit of €50. Mr Raab told BBC Radio 4’s Today programme two mobile operators, Vodafone and Three, had publicly agreed not to bring back roaming charges for British citizens. The government was aiming to get a Brexit deal with Brussels by mid-November at the latest but was stepping up contingency planning in case that did not happen, he added. He said one of the consequences of a “no deal” Brexit “is that obviously we wouldn’t pay out the money that has been agreed as part of the withdrawal agreement”. The UK would “recognise our strict legal obligations” but that the amount paid would be “significantly, substantially lower” than the £39bn agreed with the EU. Ministers believe the chances of there being no agreement are now relatively small. They are hopeful that next week EU leaders will give helpful hints at a special meeting in Salzburg. Yet there is a long way to go until Dominic Raab, or anyone in government, can be sure. And don’t doubt that many Tory MPs are adamant they simply won’t vote for the kind of proposal Theresa May has put on the table. A senior EU diplomatic source told BBC News Mr Raab’s divorce bill comments were “a statement of the obvious” as the financial settlement was part of the withdrawal agreement. “The [EU27] will keep our heads cool as we always do,” he added. Business leaders have repeatedly warned about the consequences of leaving the EU without a deal, with the CBI saying the UK would face tariffs on 90% of its EU exports and a number of new regulatory hurdles. UK consumers could find going on holiday and making card payments for EU products more expensive because Britain would no longer be part of the EU’s payments process. CBI Director General Carolyn Fairbairn said the government’s latest planning papers “make clear firms would be hit with a sledgehammer in the event of no-deal”. There are also concerns about delays at the UK border. The Road Haulage Association has warned it will take “an average of about 45 minutes to process one truck on both sides of the channel” if customs checks are put in place. “If that happens then the queues of HGVs in Kent will make the jams seen in the summer of 2015 appear as little more than waiting for the traffic lights to change,” it adds. Mr Raab said there was a risk of disruption at the border if the EU did not respond “with the collaborative spirit” he said the UK “would want to show”. The UK government was planning contra-flow systems on the M20 and was talking to EU member states about “mitigating” potential disruption. Last month the government published 24 no-deal documents covering industries including medicine, finance and farming. There were warnings of extra paperwork at borders and extra credit card charges for Britons visiting the EU. More no-deal publications are expected in the coming weeks. Labour MP Ian Murray, a member of the campaign for another referendum, said: “Nobody voted to make Britain poorer, to diminish our national influence or to ruin their holidays.